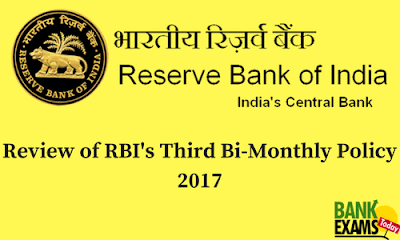 The 3rd Bi-monthly Monetary Policy Statement of the current financial year was released by the Monetary Policy Committee (MPC), Reserve Bank of India on August 2, 2017. 1. The policy repo rate under the liquidity adjustment facility (LAF) was reduced by 25 basis points from 6.25 per cent to 6.0 per cent with immediate effect. 2. The reverse repo rate under the LAF was adjusted to 5.75 per cent, as a consequence. 3. The marginal standing facility (MSF) rate and the Bank Rate also were adjusted to 6.25 per cent. The quarterly average inflation was projected to be in the range of 2-3.5 % in the first half of the year and 3.5-4.5 % in the second half, in the second bi-monthly statement. The actual outcome for the first quarter was in line with the projections. Industrial performance has weakened during April-May 2017. This reflected a loss of speed in manufacturing. In June, retail inflation dropped to its lowest reading, in the series based to 2011-12. The MPC (Monetary Policy Committee) will continue to monitor movements in inflation to ascertain if the recent drop in inflation is temporary or if a more durable disinflation is underway. The MPC also noted that while the outlook for agriculture appears strong, underlying growth in industry and services are declining. (i) The baseline of inflation, excluding the HRA impact ( from 7th pay commission) has fallen below the projection made in June. (iii) The roll-out of the GST has been smooth. (iv) The occurrence of the monsoon has been normal. The MPC expects the base line inflation to rise from the present level. Hence it has decided to keep the position of the monetary policy to be neutral. The MPC remains focussed to maintain the headline inflation close to 4 per cent on a durable basis. The Monetary Policy Committee expressed a view that there is an urgent need to impart strength to private investments, remove the infrastructure bottlenecks and provide a major thrust to the Pradhan Mantri Awas Yojana . To maintain the price stability as well as to foster the economic growth, The Reserve Bank of India Act, 1934 (RBI Act) was amended, to provide for a statutory and institutionalised framework called Monetary Policy Committee. Out of the six Members of Monetary Policy Committee, three Members will be from the RBI and the other three Members of MPC will be appointed by the Central Government. The task of MPC is fixing the benchmark policy rate (repo rate) required to keep inflation within the specified target level. The meetings of the Monetary Policy Committee shall be held at least 4 times a year and it shall publish its decisions after each of its meetings. percent until the year 2021.